Anyone knows that if clicking on "Player" button in Storyline 360, it cannot be opened up, and a table popped up like below. I also tried all other projects on Storyline 360, all has the same issue and the same table popped up every time. Any idea about what I have to do to fix it? looks like something in your file may be corrupt - could be a slide, a text box or other object on a slide. Have you tried creating a new file and importing your current file in to see if it works? If it still crashes, you could create a new file and then import the slides in one by one to isolate the corruption. Thank you Wendy for the info. But I just also tried other Storyline 360 files, all of them had the same issue - the "Player" button cannot be opened up at all and had the same table pop up. 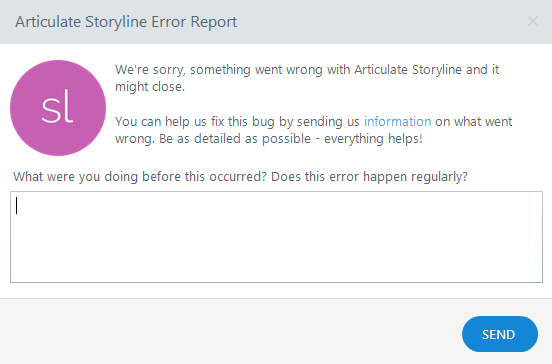 Does it mean sth wrong with my Storyline 360 other than the specific file? I will try your solution to see if it works.